Sometimes when testing newer versions of Software you discover some “unreported” enhancements that really can be a time saver. That type of enhancement is the source of this post, but first we’ll take an overall look at the enhancements to Tables in SolidWorks 2010. As reported in my SolidWorks 2010 Enhancements Highlight article, all Tables in SolidWorks 2010 now behave VERY similarly to Microsoft Excel. You can now use the Tab key and arrow keys to quickly switch between cells during data entry. In previous versions, you had to double-click EACH CELL to make a modification. This could make entering data in any type of table a painfully slow experience. Below is a link to a video that highlights the Excel behavior in tables. Last week I got a question from one of our users concerning tables. He was working on a cable drawing that contained a couple of “custom” tables that were produced in Microsoft Excel. The tables were pasted into SolidWorks which utilizes standard Windows OLE (Object Linking/Embedding) to display the Excel information inside the SolidWorks Window. In previous versions, we stored the Microsoft Excel document inside the Design Binder of the Drawing document. The user noted that when opening a Design Binder document in SolidWorks 2010, the default behavior was now set to open Microsoft Excel WITHIN the SolidWorks Window which is similar to the behavior you see when you create or edit a Design Table. As we were discussing the table behavior, a thought popped into my head. I wonder if I can import the Excel data into a SolidWorks General Table? Having the Table in SolidWorks will allow for easier table editing and more precise font and cell sizing options since OLE isn’t in use. This table was HUGE. About 5 columns wide and 49 rows tall. As a test, I created a General Table that matched the column and row count. I then editing the Excel table to where I could access the data directly in Excel. I copied all the cells to the clipboard. After exiting the Excel interface, I tried pasting the data from the clipboard to the new General Table I just created. It worked! All the Font sizes and type were perfectly preserved. So with this little trick…it won’t take very long for users to convert OLE type Excel tables to General Tables! There are lots of documented features to export tables, but nothing is shown for importing table information from a spreadsheet. 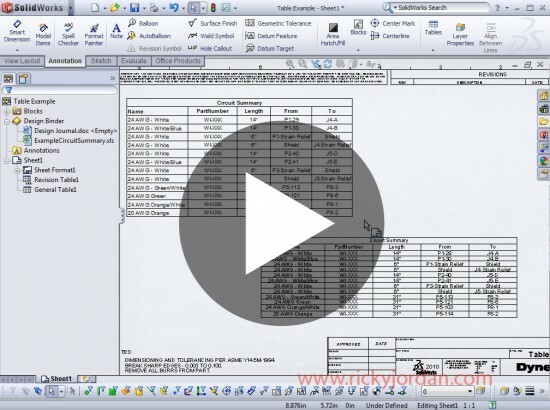 Below is a link to a video that shows off the Excel Import trick. The new table behavior is a welcome change and this little import trick really completes it. Are you talking about a tabulated dimension table that displays dimensions of different configurations? If you use Design Tables, you can display them in Drawings. You can even hide the second row that displays the dimension parameters and insert a row marking the dimension columns with a character of your choice. Great article. I love the subtle things SolidWorks does to make life easier. The problem with inserting a design table into a drawing is WYSIWYG. It's not treated as a table object in the drawing so formating goes out the window. A “table view” in a drawing will allow this to happen and present a more correct/robust work flow. You could even set the table up for dual units (this is important for us). Take a look at the “Editing a Table View” in the solidworks help file to get a better understanding. I think SolidWorks does to make life easier. This is awesome! I can't wait to try it. Have a lot of tables to do so I hope this would save time! Ahhh..those Table Views. Sorry…I didn't realize you were talking about the Configure Feature Table views. Yes…that would be an interesting addition. I haven't thought presenting it that way. Interesting idea! definitely informative nice work on the post.. This is a very helpful information. It is really good to know what are the other options or possible enhancement that you can use to save much time. Any programme that behaves like Excel is more than welcome, software that you pre know the functionality is a life saver!! Perfect article! Table functionality has baffled me for a while! I'm someone shed some light on it for me. Thanks again and keep blogging this great stuff! The article is good provides useful information that opening a Design Binder document in SolidWorks 2010, the default behavior was now set to open Microsoft Excel WITHIN the SolidWorks Window which is similar to the behavior you see when you create or edit a Design Table. .I like the article very much as it is very informative and hope to see more of such articles. Too abstract, I don't have the slightest idea about this article. yeah, look awesome.. thank's for this great article! How do I get SW to open the Excel file inside the SW environment. Each time I click on the embedded Excel file in the design binder, it launches Excel and then opens in Excel. I'm running SW2010 SP4 and Excel 2010 64 bit. This “little trick” is nothing special and I would expect it to work like this. In fact I expect the SW tables to function more like excel than they do. Even worse are the cutlist table in which one can not even propigate a formula down a column as can be done in the general tables. You say the general tables in SW work very much like excel but I find that to not be true at all. I use solidworks 2010 and am VERY disapointed in the LACK of excel type functionallity in SW tables. Take a look at tables in ACAD. You can link to far more drawing/model properties, customize the table easier, and create and propagate any formula you like just like in excel. Plus it runs smotther. I find the ACAD table to be even better than excel in some cases. When I first started using SW I was every excited about what it was capable of doing and only had positive things to say about it. Now, five years later, I am so fustrated with version after version being released without SW doing the simple things that other modeling / drafting software have mastered versions ago. SW is superior modeling software but very FAR behind when it comes to table functionallity. Then articles like this one are released, praising SW for doing something that it should have been doing versions ago. I love SW but this is me begging, just plain begging Desault Systems to please improve your tables especially your cutlist tables which are awful in there lack of functionality. I don't have any experience with ACAD tables, so I can't really comment on your comparisons to them. As far as linking to properties, columns can be linked to ANY custom property, so I really haven't seen any issues with this. 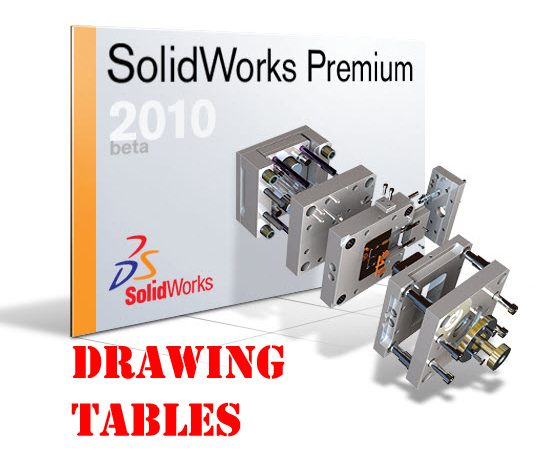 Just curious – Other than some of the table functionality, what would be your “top” enhancement requests for the SolidWorks Drawing environment? You will need a Customer Portal account to access it. Very good article. Thanks. Can’t wait to use it. Great article. I love the subtle things Solid Works does to make life easier. It worked! All the Font sizes and type were perfectly preserved. Here are a few miscellaneous thoughts. …. By the way, this is how the community wiki feature of … As the number of problems grew. I most certenly like this angle that you have on the subject.Certainly wasn’t planning on this at the time I begun searching for tips. Your ideas were totally simple to get. Happy to find out that there’s an individual here that gets it precise what its is talking about. 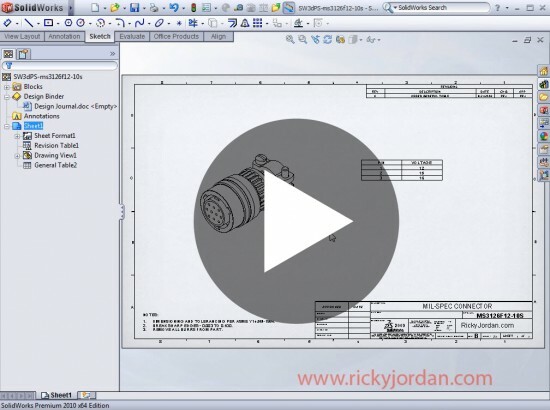 Ricky, this would be fantastic…if it didn’t crash my Solidworks. Copy in Excel, select a cell in a general table in SW, Paste….crash to desktop. Also, as far as I can tell, you can’t copy from a general table and paste into Excel. I’m trying to do something that I think is pretty basic–pull dimensions from a model in a drawing and get them easily into an Excel file to do some tolerance analysis on them. Right now I’m stuck with manual data entry for hundreds of values. Also – if you want to copy data from a General Table TO Excel, you can right click any cell and select “Save As”. Excel is one of the options for the file format. bro ! i am really wanted to insert the length in my BOM ..PLEASE RICKY HELP ON THIS ..
Great info! Many thanks for publishing. We’ll be returning not long from now. excellent article, i obviously adore this page, continue on it. Thanks for writing this! I really had good time looking over this. I bookmarked this site more than a year ago and still I visit the article to fresh up. You are Awesome! This post was very nicely written, looked after includes a lot of useful facts.Wow!, this was a high quality post.